Good Christmas Eve Morning, eP friends. 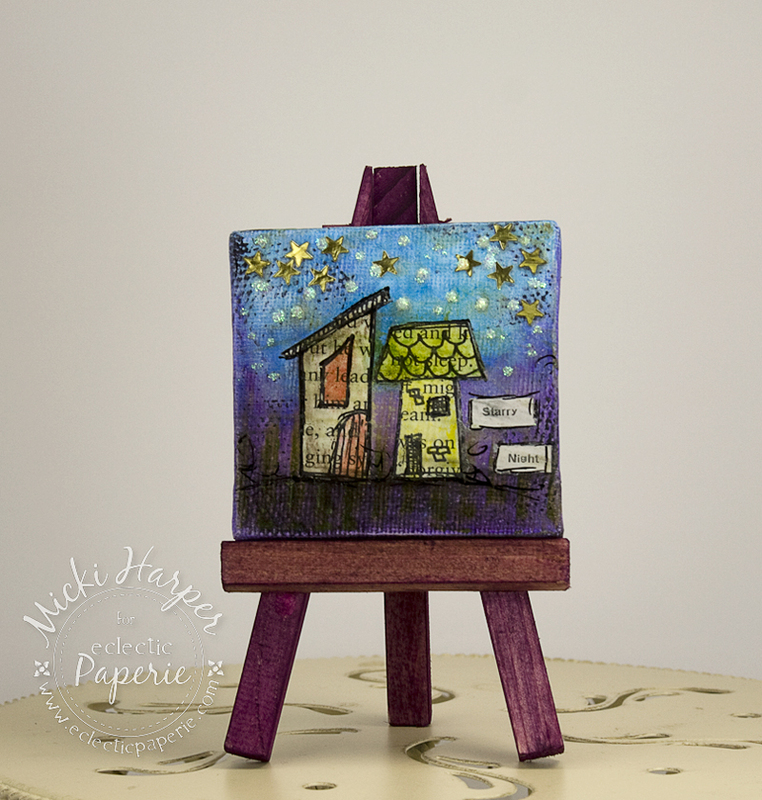 Micki here with a quick little mini canvas gift. Adventurous I am but crazy I’m not, so when I need a last minute gift, I turn to my craft room . I remembered that I had some 2.5”x2.5” mini canvases with little wooden easels and thought I’d use my Faber-Castell Gelatos. The houses were stamped onto book paper, cut out and adhered onto the mini canvas with Claudine Hellmuth Matte Multi Medium. Once dry, they were also colored with gelatos – the greens and yellows – and a paint brush. 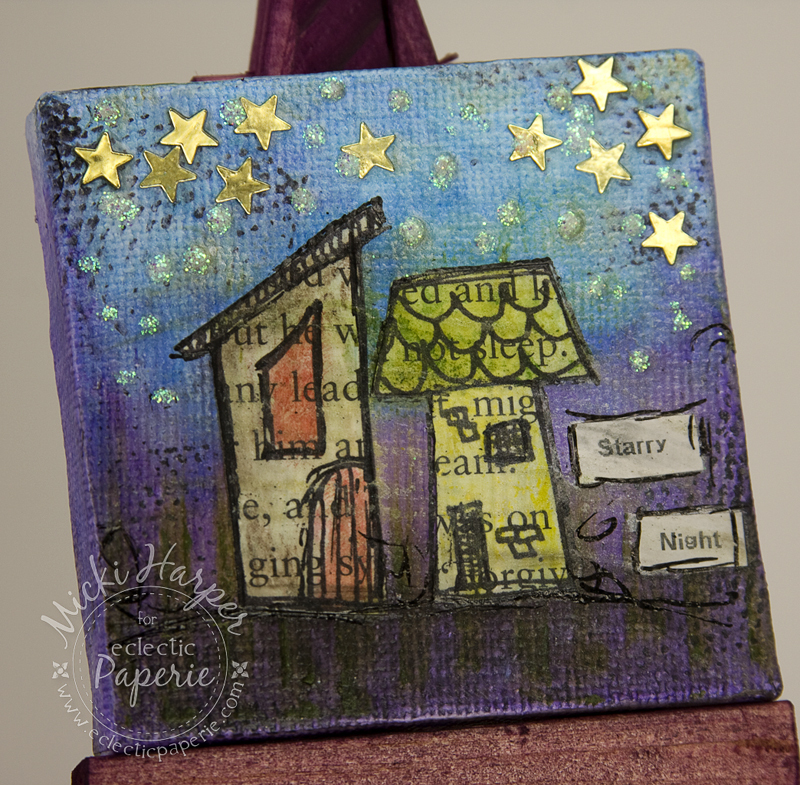 To add more texture, an old baby flip flop inked in Jet Black StazOn ink was used. 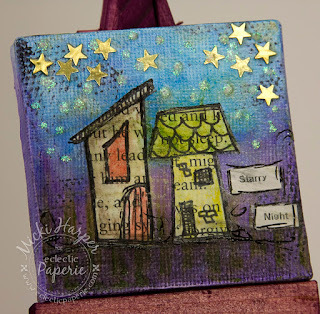 For my stars in the night sky, I used some old gold mini stars and dots of Icicle Stickles. The word strips were created on my computer, printed onto regular copy paper and glued to down with Multi Medium. I didn’t want to leave the wooden easel uncolored, so I used Seedless Preserves Distress Stain. I applied it directly from the dauber, using a brush only to get into the spaces the dauber wouldn’t reach. 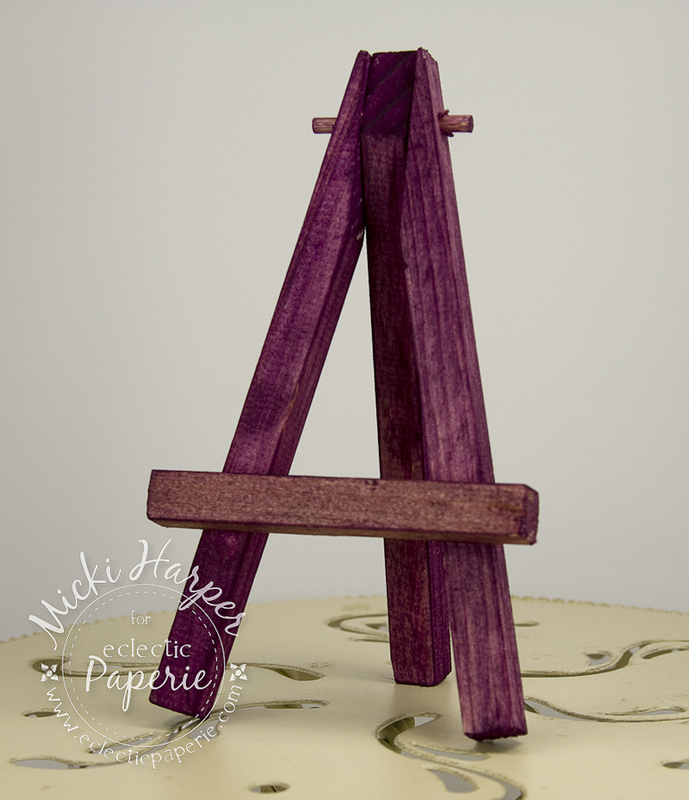 It really only took a minute to completely color the easel and that my friends, was a very good thing because I needed to make three of these :-). The whole gift took me about 15 minutes and that is a record for me! 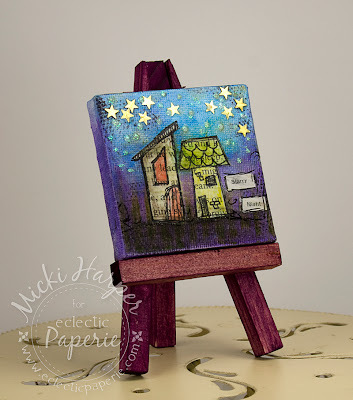 Can you imagine doing this with one of the 6x6 or even 12x12 canvases? Thanks for stopping by, and amidst the hectic chaos that some of you (like me) are experiencing trying to get last minute stuff done...... stop, breathe and enjoy this holiday! And as a reward for all that you do, hop over to the shop and treat yourself. Lots of new awesome stuff!!!! Stunning Micki! I'm so in love with this!! Wow, I love this. Thanks for sharing.